Update 9:38 PM EDT: I made some errors in my spreadsheets. I fixed them. The numbers changed a little, not much. Also, I added individual series outcome projections after the jump. 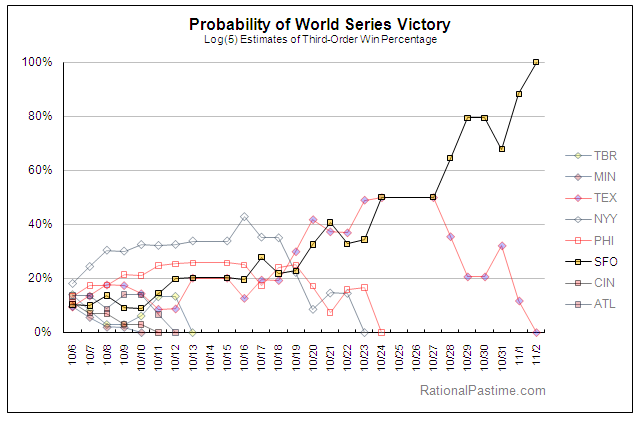 Posted above are the results of a full simulation of the 2010 postseason using the Log(5) technique, based on the third-order win percentage of all the teams participating, and assuming a 54.2% home field advantage in individual games. The chart and table will be updated as we move deeper into October. Disclaimer: I don't personally believe the Yanks are the best team this October. Like any model based on full-season data, the numbers will underestimate the viability of playoff teams that added wins to their roster (like the Phillies) while overestimating teams that lost important players to injury (like the Braves). Moreover, it assumes that being hot from April-August is just as important as being hot in September, which may or may not be true.